We took Sophie to the vet yesterday. She weighed a robust 3 pounds and stood 8 inches tall at the shoulder when standing at full attention. Although she yelped when getting her shot, she was not the least bit intimidated by the vet or the surroundings; taking in everything with swift, alert glances from her brown eyes. Now, for the "wonder dog" part. As previously told, Sophie refuses to sleep by herself at night but will sleep quite soundly if one of us is holding her. Gloria doesn't want her in bed with us, as she said sleeping with one dog, albeit an old one, is quite enough thank you. So, we bought a baby gate to put in the door of the utility room, where we have her crate, litter box, toys, and food. This way she can get out of her crate during the night, eat, play with her toys, potty, and roam at will while still being confined in the utility room. The first night she scaled the 24 inch high baby gate and we found her in the family room snuggled up at the foot of Gloria's chair. That morning, not to be outsmarted by a 7 week old pup, I affixed a 1 by 4 inch board horizontal to the top of the gate so she would hit her head when climbing the gate and be unable to climb over the gate again. Gottcha now, right? Last night, while asleep in our bedroom we were awakened by Sophie crying loudly. Thinking her voice was just being amplified by the air ducts, I dismissed it until Gloria jumped out of bed, flung open our bedroom door and found Sophie sitting there looking up at her. Not only had she climbed over the gate again, this time by somehow maneuvering around the 1 by 4 board placed so smartly by me at the top of the gate, but she had found her way right to our bedroom door. To do that, she went through the family room, down the front hallway, past the living room, into the bedroom hallway, which has two bedrooms and a bathroom all with the doors open, to find our closed bedroom door at the far end of the hallway. Sophie had not been out of the family room before. So, to find us she not only had to clamber over the modified gate but also had to traverse all new territory, and in the dead of night. Truly, she is our wonder dog. Today, we will replace the crate with an igloo kennel similar to the one she used at your place. By having a sleeping place more familiar to her, we hope she will be less anxious at nighttime. Also, we will put in a wind-up ticking clock to accompany our old clothes placed in the bottom of the kennel. If this doesn't work, Gloria may be sleeping with two dogs from now on. MY STORY: THIS STORY WILL BE FROM THE DOG'S POINT OF VIEW!!! Hi! My name is Penny! I am very hyper! I am black, white, and brown. I have a curly tail. My owner's name is Anna. Now, you must want to know one of my stories! Let me think.....I know! One time I was playing in the backyard. Then I saw a lot of men in the next yard. So, naturally, I went to see what was going on. They had this BIG ladder on the side of the house. So, I climbed it. I went all the way to the top! Well, I thought, I better get down, but I was way too scared! You have no idea how high up I was! So one of the men had to climb the ladder and get me down. That is my most favorite story! 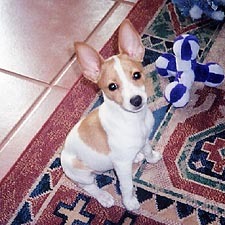 MY STORY: One night my dad was playing with his remote control car and chasing our rat terrier, Jasper. Jasper started growling at it. Then all of a sudden she took the car by the antenna and ran off. It took my mom and I about 10 minutes to stop laughing. tie dye t-shirt from petsmart, and whenever I put it on him he prances around soo full of himself. It is soo funny! Another day in life with a Rat Terrier. There is never a dull moment here with our little girl Nebula. This morning she spotted the chickens & roosters again. She decided to split them up & proceeded to chase one rooster thru the corral. If I wasn't so scared at the time it would have been hilarious. You wouldn't believe how she would not give up on that poor bird! In a flash she was weaving among 9 horses giving chase. She took off towards the back acres totally ignoring my calls. This required me to climb over a fence and retrieve her. Once she regained her senses she came right to me. Apparently the rooster flew up in the trees. All is safe & sound short of my nerves. If you want a QUICK and easy bleach tool for cleaning your kennels this is what to do. Get one of those big fluffy paint rollers, a large bucket and fill it with a strong bleach solution. You can do the walls, posts, floors and all that chain link fence. Works like a charm. You don’t need to rinse either just apply heavy and let it run. Just rinse the floor so the dogs don’t walk in the bleach. Hello, my name is Jennifer Burns and I am an animal control officer in Kansas. I have two separate friends that both have small female rat terriers. Both friend have come to me and said their dog started urinating inside the house, most notably on their bed. One owner has a year old female dog that came from the humane society. She had a baby 4 months ago. She had the dog for 3 months before she had the baby. The dog was fine before the baby but then began urinating on the owner's bed or right beside the owner inside the house. The other dog also came from the humane society and is 2-3 years old. The owner moved to a new town and lived with some friends on a farm until she found a place. Now she had moved into an apartment in downtown and has to walk the dog 2 blocks to a park with grass. She is trying to paper train the dog and is having some success. Last night after her walk the dog went into her bedroom and urinated on her pillow. Both dogs were house broke before their home situation changed and both get plenty of access to the outdoors. Neither friend wants to get rid of their dog and wants to find a solution to the problem. 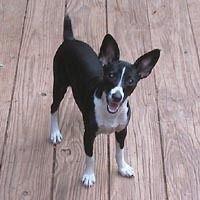 I don't know very much about rat terrier so I thought I would turn to the experts on the breed. I'm at a loss as to what they should do with the dogs and don't want them to have to take the dogs back to the humane society. With their urinating inside the house it's not very likely they would get the opportunity to be adopted again. Any advice you would be willing to share on this behavior problem is very much appreciated. Just from reading your email it sounds like just the changes that took place were enough to send a Rat Terrier into odd behavior. They tend to act out when things are changed or new introductions take place. They are extremely heavy bonders and very protective and jealous doggies. To correct some of the behaviors they might have to start at ground zero. 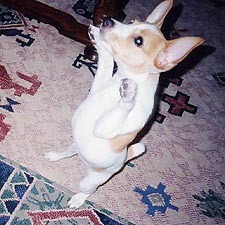 Meaning, treat the dog like it is a pup and completely restructure the potty routine as if the dog new nothing. Crate training would be very good and not leave the dogs unattended unless they can be watched. In the case of the newborn baby, it might be jealousy. The owner should show the dog lots of affection and not shun the dog because of the baby. If the dog can not be tended to at times because of the babies needs then the dog should be put in a crate or somewhere they can entertain themselves safely. That is what we can make of the behaviors. They can be corrected but it will take absolute consistency and some time. I was just browsing the internet looking for some information about rat terriers. My family and I adopted a female black tri-color in December. She is now 10 months old. We are having some problems with her and really do not know what to do. We would love to keep her, but if we do not get some good, solid advice, I just don't see it possible. That is why I am writing to you, maybe you can help. Maggie is very excited, all the time. She is constantly biting and chews on everything, including my cat and children. She is wetting in her crate at night, every night. About 1 or 2 nights a week, she barks for about 15-20 minutes when we put her to bed. She will not sit with us very often, she usually ends up back in her crate because she just will not stop jumping and biting. She jumps so high and so hard, sometimes she catches you off balance and it hurts. We are considering taking her to obedience school, is this a good thing? Obedience school would be the best thing for her and really she should have been there a lot younger. It sounds like a classic case of out of control Rat Terrier that you have. Not a joke, we know. Does the dog know what the word NO means? Does she know what Sit means? Or Down or Come or Stay? If not, then your only shot IS obedience school. If you are frustrated with her then she is also working off your frustration. The more you become frustrated, angry, upset, agitated, she will work off your feelings. She needs exercise also to blow off some of that steam she has built up and some calm attitudes on all the family’s part. Not excitement but calm relaxed time with the dog. This is the basics of what we can gather from your email. The dog seems to have no training and that is definitely a problem. If you could give us more details about what she does all day besides bites, jumps etc, in other words what do you do with the dog for teaching? Play? etc. If it is just the matter of a dog that hasn't learned proper behavior for lack of consistency on the owners part then formal training will fix your problems. If you have put a reasonable, more than reasonable consistent effort into training her then it is a different story. If ALL of your family members have treated the dog in the SAME fashion with all the SAME corrections and the dog is not responding favorably then she has behavioral problems. If ALL the family has not done the same training and corrections then it is a matter that the dog is really confused in HOW to behave. School can help a lot and your problems will be solved but the entire family must co-operate in the same fashion with a regular and we stress regular routine for the dog.